Excellent Hike Through Cloud Forest Full of Wildlife! 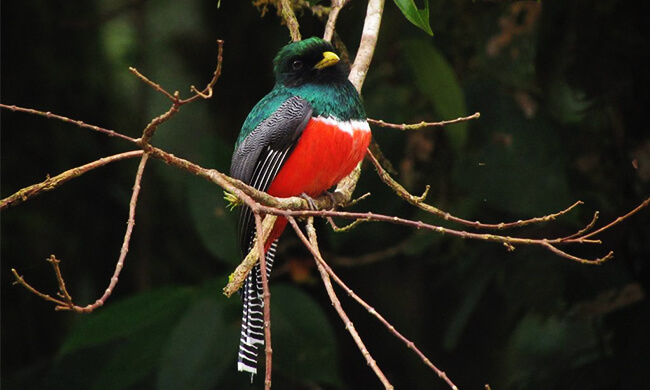 The Ecological Sanctuary is a wildlife refuge found on the Pacific slope of the Monteverde cloud forest, a beautiful mountainous area offering hiking trails that take you into and through the cloud forest passing waterfalls and coffee and banana plantations with stunning views all around. The Sanctuary maintains, preserves, and regenerates the forest by planting over 1000 trees each year and also working closely with the Bellbird association who reforest native fruit-bearing tree species. These trees are critical to the survival of the Three-wattled Bellbird and also a vast variety of birds, mammals, and exotic butterflies. This is a great experience for anyone looking for a good hike through dense cloud forest. You start your tour when you are picked up from your hotel and driven ten minutes to the Ecological Sanctuary, privately owned by a local Costa Rican family and founded in 1992. The Sanctuary conserves 30 hectares of primary and secondary forest and is a beautiful place to get up close and personal with an abundance of flora and fauna. Your guide will take you along 2.5 hours of hiking trails. You can spot a large array of plants and animals that live in the forests. You may see coatis, agoutis, porcupines, sloths, and a variety of birds such as toucans, quetzals, and bellbirds. Please note: This tour requires good physical condition as there are 2.5 hours of hiking trails available. This can be shortened for anyone looking to visit the Ecological Sanctuary who would prefer a more moderate hike. What to bring: Comfortable clothes, hiking boots, rain jacket, camera.